When I was a child, the Sisters at my primary school often talked about ‘the missions’. The term was shrouded a little in mystery but as primary school pupils we were told stories of priests and Sisters working in far off exotic lands doing great things to help the poor. As an adult, those schoolboy images now seem a little clichéd but the essence is true. Courageous people offering their whole selves as a witness to Christ by living with and serving peoples who in some ways are less fortunate or in greater need than themselves. I sometimes think of Missionaries as the extreme sports version of vocation. They are adventurers in faith. Today we have a heightened sense that in fact everywhere the Church is missionary. As Pope Francis puts it: we are all ‘permanently in a state of mission’. But he has also recently said we should not neglect what is called the missio ad gentes – mission to the (other) people or to the nations, as distinct from mission ad intra – mission to ourselves. In fact, he has declared October next year as an Extraordinary Missionary Month with the aim of fostering a contemporary awareness of the mission ad gentes. To put it simply, of our faith and charity and understanding of justice there is still much we can share with communities in the developing world. Missionary vocations enrich everyone; they are a kind of 360 degrees prism on our Church and world. Our diocese has had a long history of mission within the developing world. Bishop Owen and Fr Tom Lawn among others have worked for years in South America. We are great supporters of Caritas. And Taranaki in particular, but Hawkes Bay too, has been the home ground of many missionary vocations to the Mission Sisters (www.rndm.org) and the Columbans (www.columban.org.au). For many Kiwis, the mission ad gentes is closely associate with the Columban Fathers. Their Far East magazine has been a constant in homes and church porches for decades. And many New Zealanders have been and still are Columban Fathers (there are also Columban Sisters, though few if any Kiwis among them, and a growing lay network of missionaries). This year the Columbans are celebrating 100 years of mission. New Zealand is part of that story and I hope part of their future too. It was great then to celebrate 100 years of the Columbans at a Mass, on Friday 27 July, at Ss Peter and Paul Church, Lower Hutt. The Mass presided by Cardinal John, and concelebrated by Bishop Owen and myself, was vibrant, multicultural and full of joy. Many Kiwi Columbans had returned from their places of mission – including Pakistan, South Korea, Japan, Philippines and Peru – to give thanks to God and their families for their vocation and to relax together as members of a far flung missionary congregation. I was delighted to see a good contingent of Francis Douglas College (New Plymouth) boys taking part in the Mass. Their school is named after a famous [New Zealand-born] Columban who was martyred in Japan by the military for standing true to our faith. 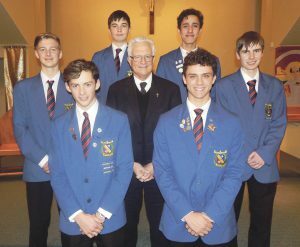 Rightly the boys are proud of their patron’s story – one of humble, faith-filled heroism – and indeed they shared with the congregation a video they have recently made depicting Francis Vernon Douglas’ last days. At the conclusion of the Mass, I gave each of the boys a brochure outlining the Columbans’ vocation. I invited them to think seriously about what and where the Lord may be calling them. I sometimes think of Missionaries as the extreme sports version of vocation. They are adventurers in faith. For a nation that loves extreme sports why should we not see it as probable that we might gift another generation of missionaries for a world craving for faith, justice, fairness and purpose in life? Please support New Zealand missionaries with your prayers and encouragement.